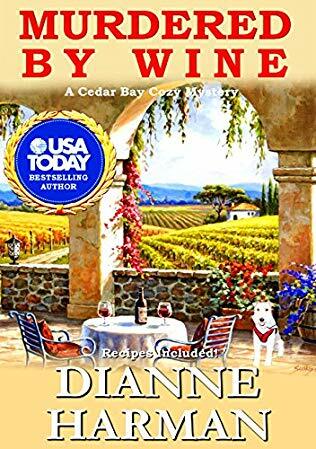 It’s not Death by Chocolate, it’s Murdered by Wine: A Cedar Bay Cozy Mystery! Folks, we took a look at our recent offerings: presidents, borders, sharks, spies, Dungeons and Dragons…lobsters…and we realized one thing hard and fast and deep and true: it was getting pretty dude-centric around here, so it was time for COZY MYSTERY MONTH! And you know what Cozy Mystery Month means. 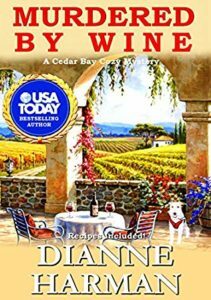 It’s time to drink precisely one glass of wine and poke around and maybe help solve a murder. So come along with our plucky, level-headed hero, as she active-listens and asks all the right questions to get strangers to open up to her, pounding out notes on her iPhone so she doesn’t miss any details! Take some side trips so her husband can golf! And make sure you try every good restaurant in town, because you never know what kind of clue will turn up…or what kind of recipe inspiration you might get! The weather is fine, the Bed and Breakfast is waiting, and there’s a mystery to solve, people, so let’s get a good night’s sleep, eat a light breakfast, and get to the bottom of just who was Murdered by Wine—and why—and we better do it soon, because Mike has an early-morning tee time and Kelly just confirmed our reservation for dinner, and it’s a little bit on the early side, oh and we have to make sure we call Julia to check in on the kids’ fever, oh and I should do a little shopping, it would be so nice if we could bring back a little something from our trip an—.